The difference between a good torbjorn and a bad one is how well the player understands the map and his turret placements within it. Since the general strategy for Torbjorn staying back and letting his turret do a majority of the damage. Well-placed turrets on the map are torbjorn strengths while heroes who can destroy them are his weakness. Thier are a couple of characters in particular that are effective Torbjorn counters. Pharah, Widowmaker and Junkrat are among the best Torbjorn Counters in Overwatch. Players are advised to know the maps of overwatch very well to play an effective Torbjorn. 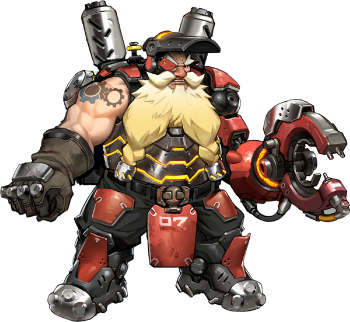 Torbjorn is best used on defense rounds since he can make better use of his turret placements. players will enter through specific areas this allows torbjorn to place the perfect turret for maximum damage. Often time the best turret placement is not in the open for damage. Around corners and even hidden away in buildings provide the shelter needed to keep the turret alive and doing damage. Pharah: Can be weak versus a Torbjorn is she is inexperienced however a good pharah player will make short work of your turret with a couple of rockets. For the most part, pharah is considered one fo the best torbjorn counters; it can go both ways in some cases. Junkrat: Spamming frags is an easy way to deal with a torbjorn turret and no player not even torbjorn himself would want to stand next to the turret. junkrat is one of the best torbjorn counters in overwatch if played correctly.